First of all, we’re just proud of the fact we were able to walk into Rose’s on a humid summer day and get a seat within half an hour (it can be done!). After coming off that high, we were brought back to cloud nine with their incredible pork lychee salad. Composed of pork sausage, habanero, peanuts, and raw onion, it’s a combination of ingredients that somehow works, and works well. Like, really well. I’ve expressed my love for Ren’s Ramen countless times, but it really is one of the best ramen shops in the area. Despite the lack of parking, the Soup Nazi-reminiscent list of rules posted on the front door, and cash-only policy, it’s still worth the trip to Wheaton. 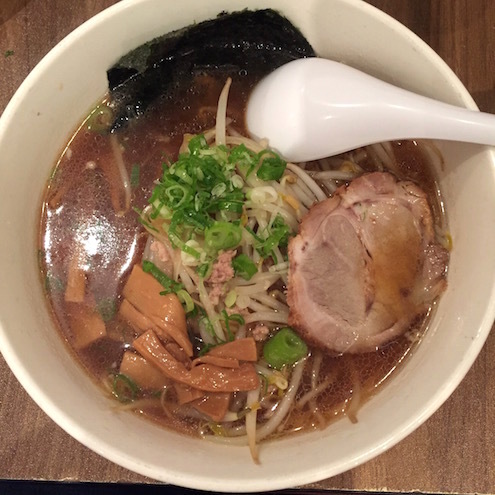 My go-to is their Sapporo-style Shoyu ramen. For $10 you get a heaping bowl of soy sauce flavored soup prepared with Tonkotsu broth, roast pork, bean sprouts, bamboo shoots, scallions, onion, and ground pork. It’s a rich and hearty ramen that makes for an ideal wintertime meal. What needs to be said? 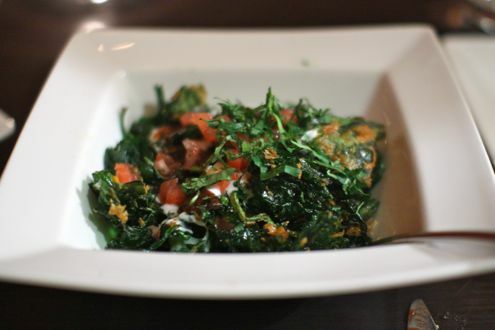 This is a quintessential dish at a classic venue. 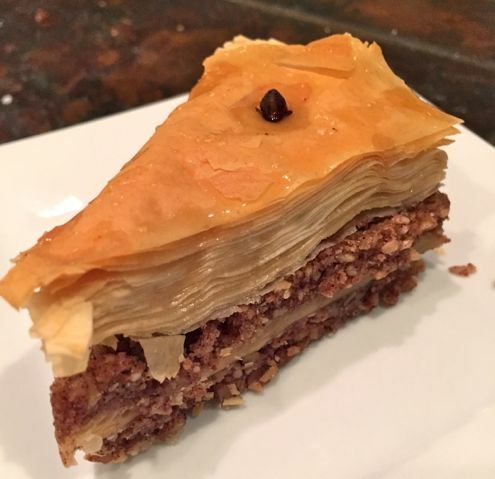 This Beltsville restaurant servers up some incredible gyros (although I’m still partial towards Marathon Deli in nearby College Park), but the baklava stands out as one of their top dishes. With endless layers of filo held together by honey, it makes for a wonderfully sticky treat. Silver Spring’s Ethio Express Grill marks the first time Ethiopian food has entered the incredibly popular fast-casual market, but rest assured quality is not compromised despite the express moniker. 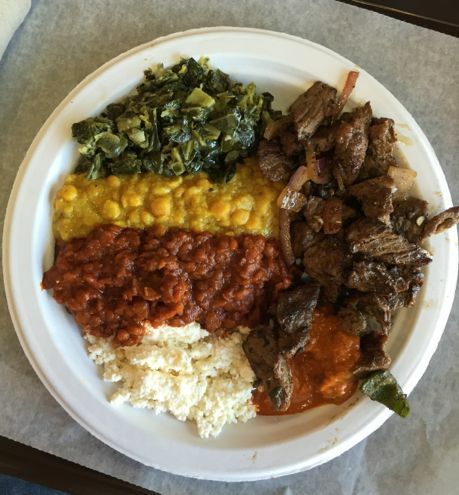 Their trademark platter features grilled beef (tibs), hot sauce, ayib cheese, collard greens (gomen), spicy lentils (miser), and split peas (kik), and is accompanied by warm injera bread. It made for a quick, affordable, and certainly delicious lunch. Chef Makoto Hamamura is doing incredible things at Paul Ruppert’s Petworth restaurant, where Japanese cooking wonderfully intertwines with French cuisine. 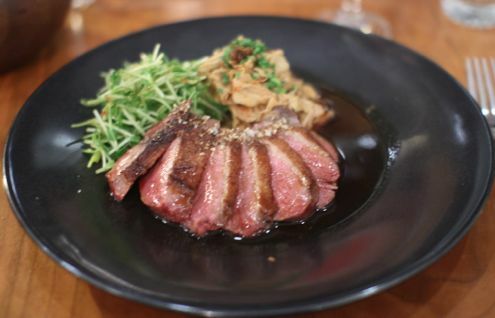 Paired with pea shoots, braised Yuba, and dan dan sauce, the savory, perfectly cooked duck was the highlight of an outstanding birthday dinner. Frankly Pizza has been one of the biggest additions to what has been a somewhat lackluster dining scene in Kensington. Starting off as a mobile wood-fired pizza trailer back in 2011, Frankly Pizza opened its doors in 2014 and has been incredibly busy since. All of their pizzas are outstanding, but the Hot Mess really stood out. 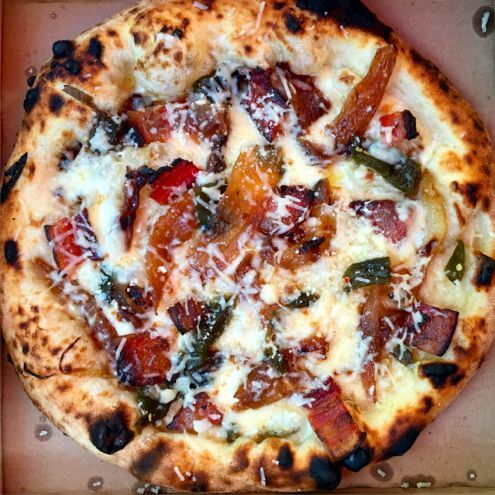 Topped with mozzarella, pickled jalapenos, caramelized onions, bacon, Gruyere and Romano, we had to get this amazing pie to go since the wait for tables was so long! Chef Kaz Okochi’s downtown restaurant is more than just a sushi spot, albeit a great one. 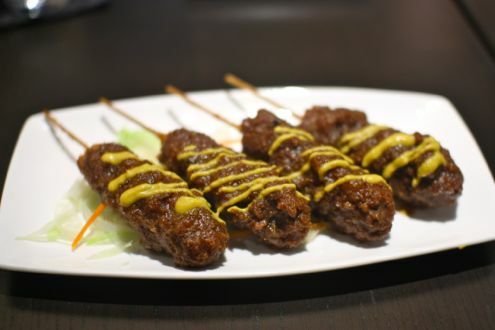 From an extensive sake menu to an array of small plates, KAZ also offers some popular Japanese street food such as these incredibly delicious panko-crusted pork and onion skewers. Topped with sweet red miso sauce and Japanese mustard, this deep-fried delicacy makes for great bar fare. 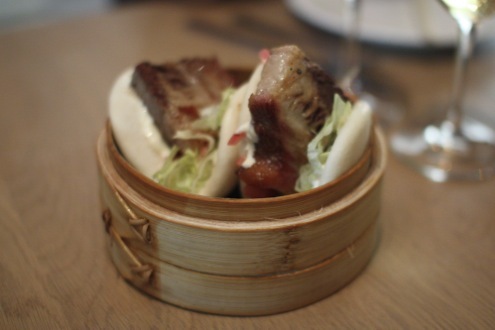 The opening of David Chang’s latest venture in CityCenter brought much ballyhoo to the District, and while no restaurant can match that amount of hype, Momofoku delivered when it came to its brisket buns. The combination of pickled red onion, cucumber, horseradish sauce, and slow-roasted brisket is well worth the wait. We haven’t even had time to write about our wonderful dinner at Peter Chang’s Rockville spot from last week yet (rest assured, we will), but the dry fried eggplant was an exceptional dish and nothing like I have had before. They were essentially eggplant fries sans any trace of grease while the outside remained delightfully crispy. 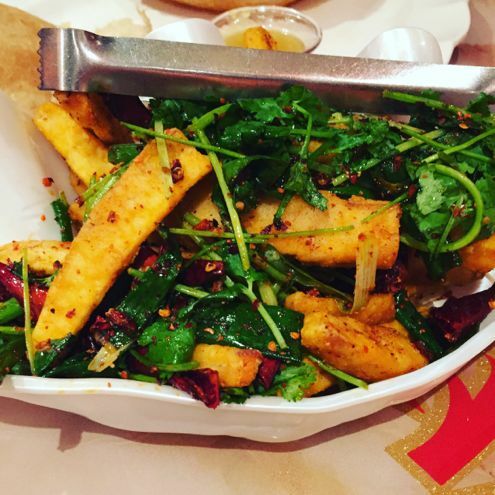 Topped with chilies and Sichuan pepper, this isn’t even the spiciest dish on the menu, but if you’re a fan of heat then the dry fried eggplant is a must-order. Rachel and I have used LivingSocial countless times, especially when it comes to restaurants, but now they have introduced a new feature entitled Restaurants Plus. 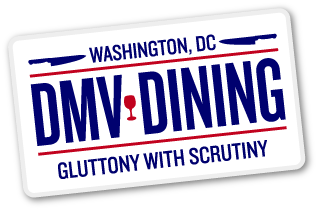 Restaurants Plus gives diners the opportunity to earn cashback from over 140 participating restaurants in the Washington metropolitan area just by paying with their enrolled credit or debit card. There’s no voucher or pre-purchase required, making the transaction utterly seamless. Let’s say you’re in the mood for pizza and want to earn cash back on your purchase. Simply use LivingSocial’s map tool, filter pizza locations, and viola! Now you’ve found 21 participating pizza joints that are offering 10%, 20%, or even 30% cashback when you pay with your registered card. There are some great restaurants already participating, such as Toro Toro, Kaz Sushi Bistro, Baby Wale, and Fat Pete’s Barbecue, just to name a few. Diners simply register their credit or debit card with LivingSocial and then use said card to pay for meals at participating restaurants. So head out and grab some sushi and sake at Kaz or order the faux ribeye at Baby Wale and get cash back from your meal this evening. Just be sure to register your card first! 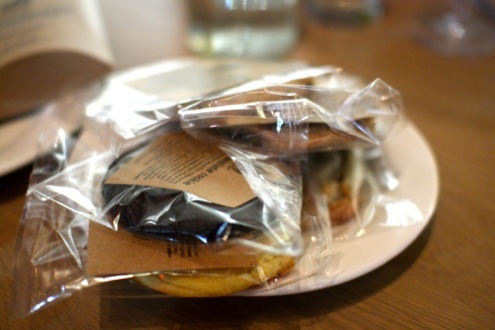 And while David Chang’s latest venture offers limited reservations on their website, they also offer a few tables on OpenTable as well, the latter of which got us a table for four last Saturday evening much to my amazement. Given the fact that we need to hire a babysitter these days, this was a very ideal situation that was validated more so by the fact that the wait time for walk-ins was three hours. Yes, you read that right. Three hours! The four of us decided to share a variety of appetizers amongst the table before ordering their own entree. Without hesitation we kicked the meal off with an order of their brisket buns, arguably my favorite dish of the evening. Topped with a creamy horseradish sauce, picked red onion, and cucumber and sandwiched by an incredibly warm and soft bun, the slow-roasted brisket was delightfully tender and flavorful. The pork buns, stuffed with hoisin sauce, scallion, and cucumber, were nearly as good but the brisket variety was my preferred choice of the two. The spicy cucumber appetizer was a very good if not unique appetizer. 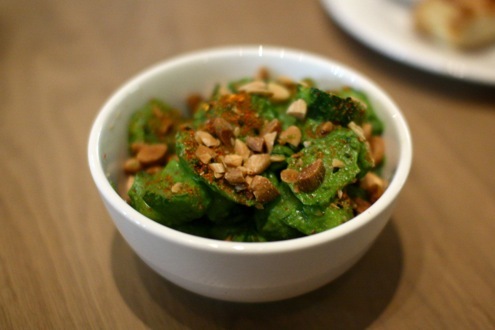 The thick slices of cucumber were smothered in a spicy green sauce and topped with crushed peanuts, but the heat was mild enough that it didn’t overpower the dish. Kudos to Eater on the tip as it was a great suggestion that we never would have ordered otherwise. 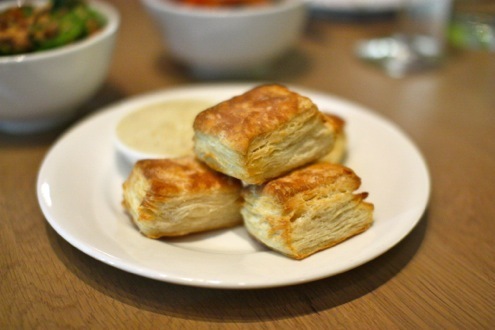 The biscuit bites were another favorite amongst our party, and the creamy Szechuan honey butter definitely stole the show. 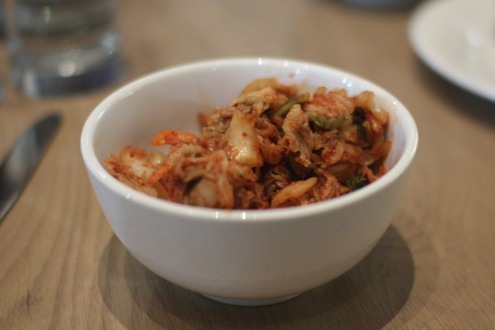 We also got an order of the kimchi but it was pretty standard stuff. Not bad but nothing out of the ordinary. I opted for the kimchi stew for my main course as the ingredients really piqued my interest as opposed to the other ramen offerings. 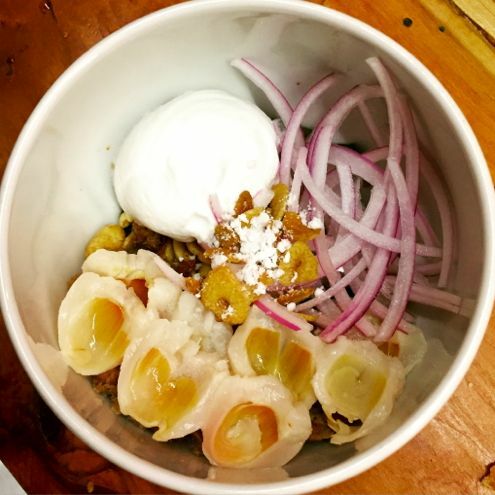 Served in a behemoth bowl, Chang uses a pork bone ramen broth that is accented with two-week old kimchi, generous slices of pork shoulder, roasted onions, and rice cakes. The stew had just the right amount of spice without going overboard, and while $19 is a bit steep, this could have easily been shared amongst two people. Rachel ordered the hozon ramen which came with scallion, kale, and panisse. 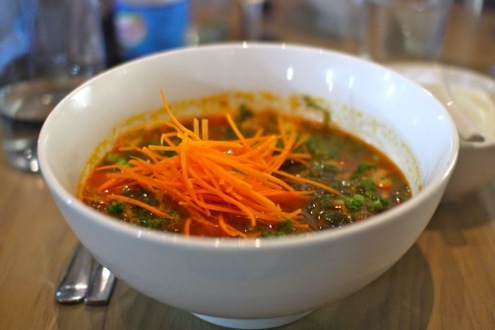 Being a vegetarian ramen, it was very different from the traditional types of noodle soups and even more so then any other vegetarian version. 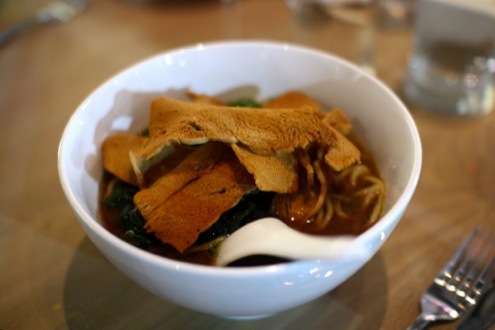 The broth is actually chickpea-based and is very earthy and rich while the noodles were pretty perfect. The other thing she didn’t love about it was the panisse, which was essentially like large pieces of dried bread or croutons on top. The problem was that there was so much of it that it got soggy and appeared to overwhelm the rest of the dish. 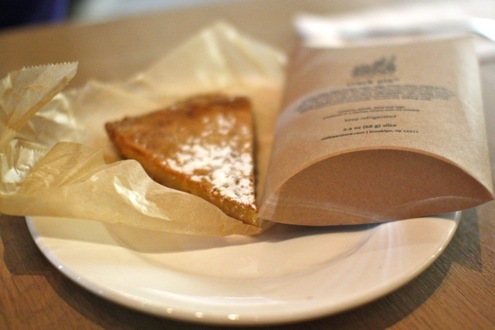 For dessert, we decided to share a slice of Milk Bar’s famous Crack Pie between the four of us. Suffice to say the pie was a bit of a letdown as the typically decadent pastry was a bit stiff and nearly required a knife to cut. Maybe we should have gotten the full pie instead, or perhaps we just got a bad piece.We also got a bunch of individually wrapped cookies to go because, well, it’s pretty damn impossible to leave the place without a compost or corn cookie. And when you live a couple of miles down the road from Ren’s Ramen, it’s really hard to justify spending $18 on ramen that’s just not as good as the no-frills Wheaton shop for the expectation of the aforementioned kimchi stew. 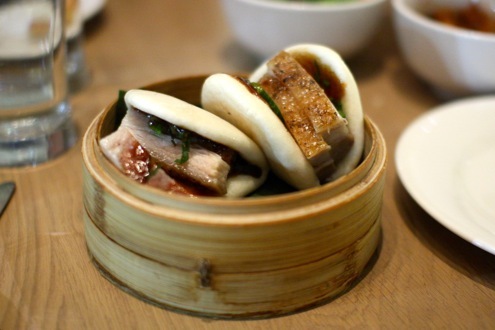 Where Momofoku really shines is with its terrific buns and small plates. At any rate, it’s nice to see David Chang return home after all these years. So yes go, but for goodness sake, make a reservation! Now pass me a corn cookie.